Pulling a trailer or vehicle behind a pickup, SUV or motorhome that exceeds the vehicle's towing and gross combination weight ratings (gcwr) is a formula for trouble. Likewise, overloading a tow vehicle, trailer or motorhome with passengers and/or cargo beyond its maximum carrying capacity (gross vehicle weight rating, or gvwr) may also contribute to many potentially negative consequences. Some of the more-serious results include insufficient power in a tow vehicle or motorhome, handling difficulties and poor fuel mileage. Too much weight can also contribute to increased wear and premature failure of engine and transmission components, brake linings, U-joints, axle bearings and a host of other critical parts. To avoid such problems before they can develop, it's best to know how to determine all towing and carrying limits of any tow vehicle, trailer or motorhome before spending a lot of money. Let's take tow ratings, for instance. If your sights are set on buying a trailer, the main question to ask is: Will your current tow vehicle handle the weight of the towable, including its passengers, plus any cargo and fluids it may carry? Buying a tow vehicle poses a similar question: Is it rated to handle the weight of your existing trailer? And if you buy a motorhome, Is it rated to tow a dinghy vehicle? A good place to find tow ratings is by reading the owner's manual of the intended tow vehicle or motorhome. However, the most accurate estimation of a vehicle's towing ability is to weigh the vehicle with all fluids (water, fuel, etc. ), LP-gas and approximate cargo aboard. Add to this about 154 pounds per passenger. Finally, subtract this amount from the vehicle's gcwr and the remaining weight is the amount it can reasonably tow. Trailer and motorhome weight-related capacities, such as gvwr, cargo carrying capacity (ccc) and the unloaded vehicle weight (uvw) may be found on a manufacturer's plate or printed label in a conspicuous location on the unit itself. However, don't make the mistake of assuming empty or dry weight is the amount your vehicle will weigh when loaded; this can be a far cry from reality. 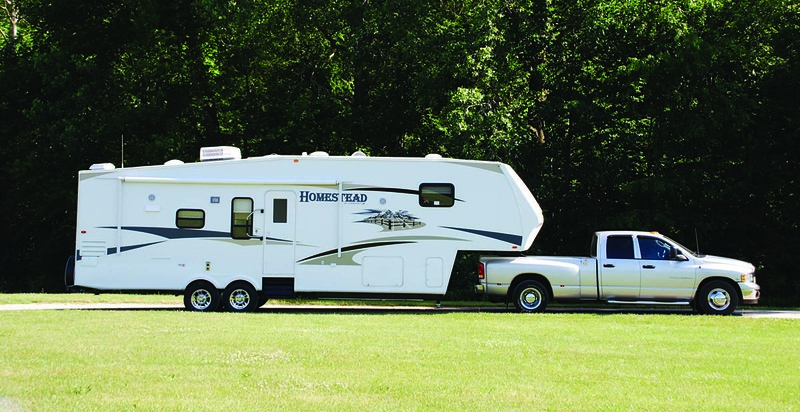 The ccc of a trailer, truck camper or motorhome is very important, and indicates the weight that can be safely added without exceeding a vehicle's gvwr. This figure can be determined by subtracting the wet weight of the vehicle (which includes full freshwater, LP-gas and fuel tanks) from the vehicle's gvwr. For good measure, subtract the estimated weight of all intended passengers as well. If you are not sure of the ccc on a vehicle, ask the dealer or seller for a certified weight slip. Then add in the estimated weight of water (8.3 pounds per gallon), LP-gas (4.2 pounds per gallon) and gasoline (5.6 pounds per gallon) or diesel fuel (6.8 pounds per gallon). Subtract the maximum weight of all fluids, including the water in the hot-water tank (usually 6 or 10 gallons), plus estimated weights of all passengers calculated at 154 pounds each, from the vehicle's gvwr and you've got your ccc. If there is little or no ccc after doing the above calculations, it's best to shop for a different vehicle.